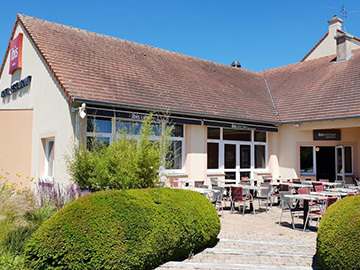 The ibis Falaise hotel is located in an oasis of greenery. We were able to block 35 soundproofed rooms with free WIFI. The hotel offers a a 24-hour bar, a relaxation lounge with pool table and a fireplace and a fitness center for those who enjoy a little workout (open 7am to 10 pm). Drinks can be had on the terrace in (hopefully) warm weather. Plus there’s a free private car park for our beloved playthings. 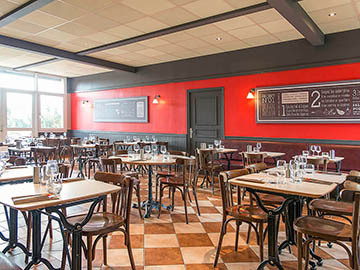 The Ibis breakfast is an all-you-can-eat buffet, combining all the elements of a traditional continental breakfast. Wherever you are in the world, you'll find Ibis breakfasts also include local specialties for you to enjoy. The dinners on Friday and Saturday are included in the room rate. As is water, 1/4 liter of wine and coffee. To secure the booking and the rates, we will have to centrally manage and pay the hotel – in advance! In your confirmation email you will receive the payment details and we kindly request you to send the money as soon as possible.